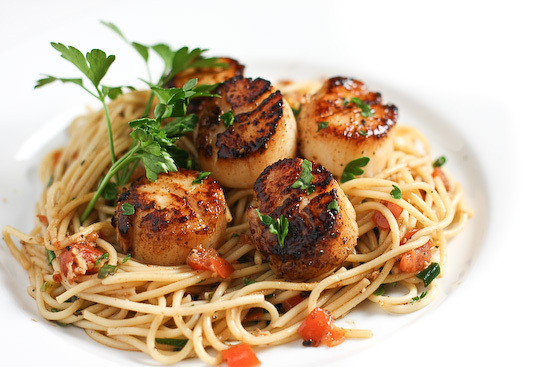 It looked so good, however, that I wanted to share it with you … in case you love scallops. In case you only eat scallops about twice a year like we do. In case this photo makes you want to run to the grocery store to buy scallops — the effect it has on me. Enjoy this recipe from the Steamy Kitchen! 1. Cook the pasta in salted water per the instructions on the box. Drain and set aside. 2. In the meantime, prep all the ingredients and have them at the ready nearby. For the scallops (or shrimp), use a couple of layers of paper towels and pat very dry. Move the scallops to a clean sheet of paper towel and pat dry once more. Season with salt and pepper on both sides. 3. Heat a large frying pan or saute pan over high heat. When hot, swirl in the olive oil. Add the scallops to the pan, not touching. Give each scallop ample room so that they can sear properly. Cook for 2 minutes without touching (1 1/2 minutes if using smaller pieces of scallops or shrimp) then flip and cook for another 1-2 minutes until cooked through. Remove to a plate. 4. Turn the heat to low. Add the butter and the garlic. Saute for just 10 seconds and then add the tomatoes. 5. Turn the heat to high and add in the white wine (or beer or vegetable stock). Let it bubble a bit for 30 seconds and use your spatula to scrape up the bits in the pan. Season with salt and pepper (go light on the salt … remember your pasta is lightly salted now), throw in the parsley and then add in your cooked pasta. Stir well to let the sauce coat the pasta. Serve with the scallops.